A decade of anything seems significant in a world that gets its dander up about Twitter expanding from 140 to 240 characters. However, a decade needs more than even the new verbosity now found on Twitter can handle. Ironically, the decade and the event I’m thinking about was mainly documented in 140 character bursts on Twitter. Having just attended my tenth Wine Bloggers Conference (WBC), which is all of them by-the-by, I can’t help but take some time to contemplate the changes in the conference and the industry over the last ten years. As that’s a topic worth far more Twitter can contain, it would seem that blogging about it is a rather obvious idea. In ten years, WBC has gone from a wine hackers party of rebels in year one to a decidedly establishment event. I am sure it is more profitable now - it certainly looks that way - but the edginess is gone that existed in the early years, both of which are probably good things. If WBC could not show a profit it would have disappeared years ago. The edge is gone because the genre has matured and that’s the natural way of things. Wine blogging is not cutting edge anymore as well proven by wine blogs that have become the wine corner of the Internet’s equivalent of “newspapers of record”. I remember how exciting it was to discover Alder Yarrow’s Vinography in 2004. Then it seemed subversive, today it is a standard recognized as important by wine writers of all stripes. In year one, 2008, the conference was controlled more by the attendees than the organizers. Held at the delightfully kitschy Flamingo Hotel in Santa Rosa, in the heart of Sonoma wine country, at #WBC08 you were more likely to find a bigger crowd by the pool pulling corks than in the seminars. Sonoma was the perfect place to host this first year as there were a lot of rebel winemakers there too. In the evenings we took over an undecorated conference room where many dozens of bottles of wine contributed by the bloggers, not the sponsors, were shared in a free-form bacchanalia. There was no controlling this crowd and no one tried. It cannot be forgotten that the original crew that attended the first WBC was a creation of Twitter. In those days, Twitter was more like a chat room, not at all like the behemoth it has become. We had all met each other online and had become a community before we ever met each other at #WBC08. Meeting in person all of these people that had become your friends online instantly transformed the experience into a celebration - a celebration of new friendships that continue to this day. Perhaps sensing the un-conference in years to come, a group of us did not stay at the hotel, but at the beautiful vineyard home of @PinotBlogger (Josh Hermsmeyer). My other roommates were @LennThompson and @WineHiker (Russ Beebe). It was here that the first “going rogue” party happened, but we did not know it at the time. Dozens of wine bloggers descended on our house that night and it is impossible to guess how many bottles were opened and shared. It was a good thing the house was out in the country as I am sure any neighbors would not have been pleased. Needless to say, after such an experience few who attended year one missed year two. The success of the first year meant that in the years following the inmates lost control of the asylum. But this was not to last for long as soon the un-conference, so named at the first year of WBC, would return. There needed to be a place for the old guard, the hackers. 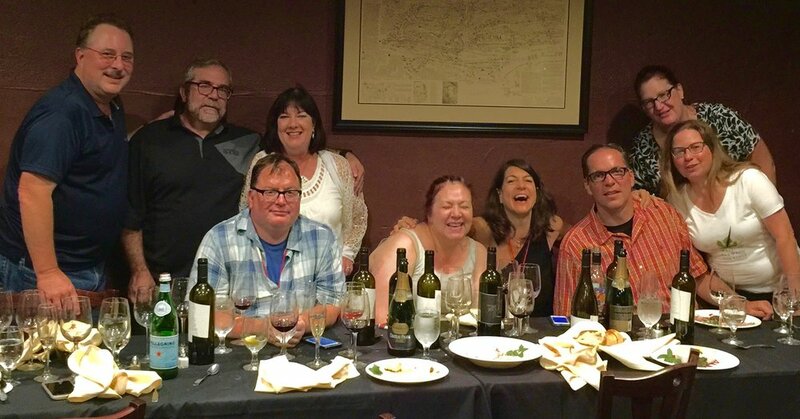 Over the years, the original crew would be joined by like-minded wine bloggers as they lost their newbie status and started to understand the real value of the event. That value is the community and the event itself is simply a framework to bring us all together. The organizers of the Wine Bloggers Conference have a real dilemma. How do you create a conference that will please both veterans and newbies? The answer is simple, you can’t. This conflict was sure to mean an un-conference would have to exist. The un-conference is not an insult to the organizers or the event, but is a natural expression of the maturity of the event and the complexity of the now wide range of people that call themselves wine bloggers. In my opinion, it adds richness and a depth to the event that keeps the veterans coming back for more. The tenth conference, #WBC17 was held at the Hyatt Santa Rosa, quite a contrast to the original site at the Flamingo. There is nothing kitschy about a Hyatt. Smooth and professional from start to finish, the Wine Bloggers Conference reflects the state of wine blogging today. No longer just a bunch of wine hackers, wine blogging too has become smooth and professional. A quick look at Twitter today and you’ll find wine bloggers being whisked off, all expenses paid, to wine regions all over the world, their published words now just as coveted by wine marketers as those in the increasingly irrelevant glossy wine magazines. There have been many WBC highlights over the years: Walla Walla, Penticton, Finger Lakes, Willamette/Portland come to mind right away. At every event, other than year two, I have been a host of a un-conference event. But it was not until #WBC11 (the fourth conference) in Virginia that my, now annual, WBC un-conference Saturday night dinner came into being. What started as a few people escaping in search of better food and air conditioning (summer in Virginia!) evolved year-after-year into a WBC tradition. I will say that none of this would have happened without my friend and un-conference dinner partner-in-crime Thea Dwelle (@LusciousLushes). I am always honored by those that attend my humble dinners, while they may not have the elegance of the events at the big corporate winery sponsors, they do have the best conversations and, if I say so myself, more interesting wines and people. Now that the hackers have lost control of the conference itself, un-conference events are the only way left for wineries that are hackers to share their wines with WBC attendees. The costs of official sponsorship at WBC are now simply out the range of small wineries. I, for one, will refuse to give up on WBC, but from here on out you’ll only find my wines at the un-conference and, of course, at my dinner. #WBC18 will be in Walla Walla once again. A wonderful town and wine region. However, reflecting the now corporate nature of WBC, they have planned the event in October. That means during harvest, which means actual winemakers will, at best, have a difficult time participating. I understand why the organizers are not concerned as most winery representatives that attend don’t get their hands very dirty during harvest. Marketing and sales directors will have no problem attending and, perhaps, this better represents what the conference is about today. However, I will be there at least one day. There is a dinner tradition I need to keep up. A WBC without a un-conference would be soulless, like a wine without terroir. Don’t worry, you’ll be able to find all the wine hackers at #WBC18 on Twitter. We’ll be pulling corks with the same passion we did in year one.